What an enjoyable day it has been today! The air was fresh and filled with the scents of eucalyptus and pine, more so after the rain that fell all day yesterday. The hummingbird on one eucalyptus tree was quite co-operative and allowed me to photograph it. A pity that I did not have a faster zoom lens! I also managed to photograph two different kinds of woodpeckers and today I was able to identify what they were. There seem to be several woodpeckers hanging around my property. They have been pecking away at the old fence posts and the utility pole across my house. I even saw a couple drinking and bathing in the puddle of water on my dirt drive way! The yellow-rumped warblers are also plentiful this time of year, and I think they still need to get used to seeing me walking around with my camera! I took some pictures but they were not as sharp as I would have liked. Not to worry because there are other opportunities! I have not seen any Western Blue Birds this week. They were around two weeks ago, a family of five. I know they will come back, and I cannot wait to photograph them too! 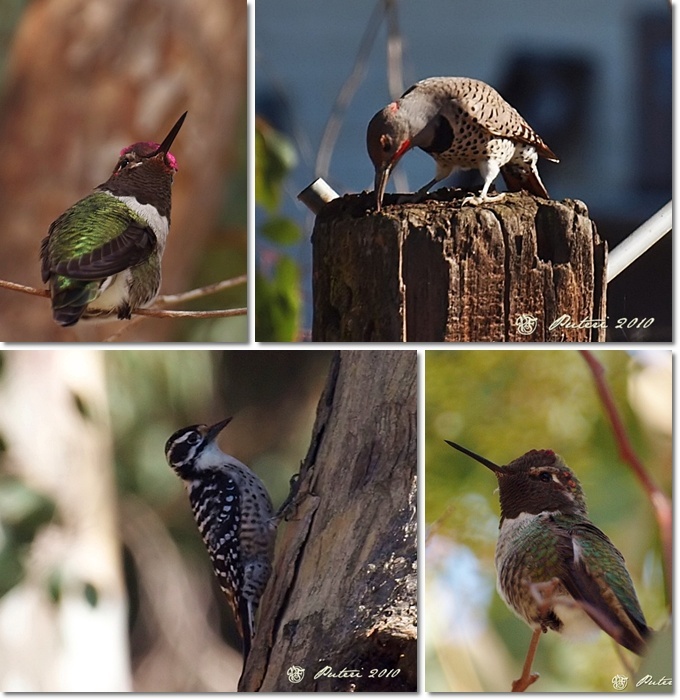 What fun to have different kinds of birds to photograph right in my own front and back yards! It is the time of year when birds seem to gather in my front and back yard. And I love it! I take out my camera and try to photograph them! Last fall, I thought about getting myself a hunting blind so I can hide in it and wait for the birds. This year, I WILL buy that blind! A blind is not all that I will be getting this year. I am learning all about digiscoping where you use a digital camera with a spotting scope. While studying on that method of photography I discovered that some are using a telescope with their dslr cameras and the output from that set up seems to be very encouraging. That is why I will be getting myself a telescope that is suitable for digiscoping! Oh yes! Ever since I successfully took some beautiful pictures of birds in my backyard when I first got my bridge camera, I have been quite obsessed about photographing birds and learning more about birds. It is now the time of year where the birds seem to gather in large numbers in my yard. I have even started reading up on digiscoping (the use of a digital camera and a spotting scope) and am seriously considering getting a good quality spotting scope so that I can photograph the birds several yards away from my back patio. Yesterday as I was browsing through some digiscoping videos on YouTube, I decided to look for some bird videos done by David Attenborough. There were several videos there and I was quite entertained by them. The video of the Lyre bird (such a beautiful tail!) of South Australia especially captured my attention. It reminded me of my friend's mynah that was able to imitate the sound of a car alarm. You must watch both videos! Absolutely amazing!